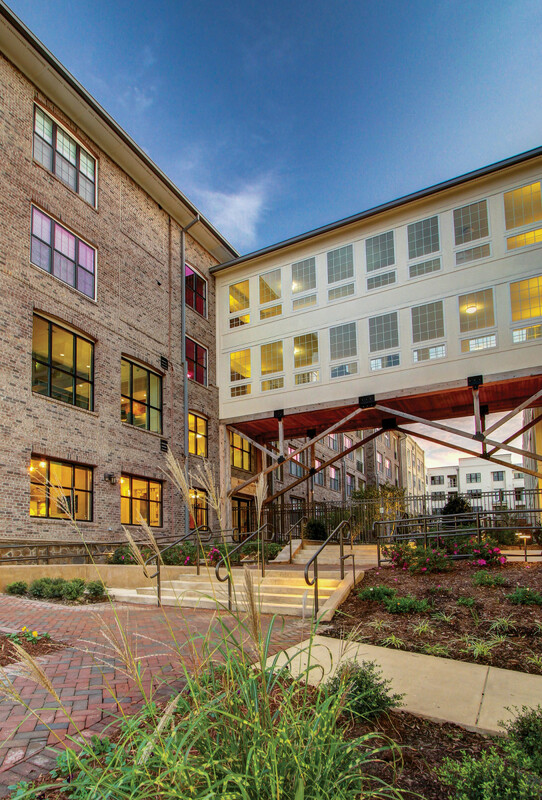 Ninth Street, a recently completed apartment complex in Durham, North Carolina, is designed to pay homage to the neighborhood’s rich industrial past. Once home to a prosperous factory, the 7-acre site, which lies between a thriving commercial corridor and the remnants of a mill that has been converted into lofts and offices, was an empty lot. 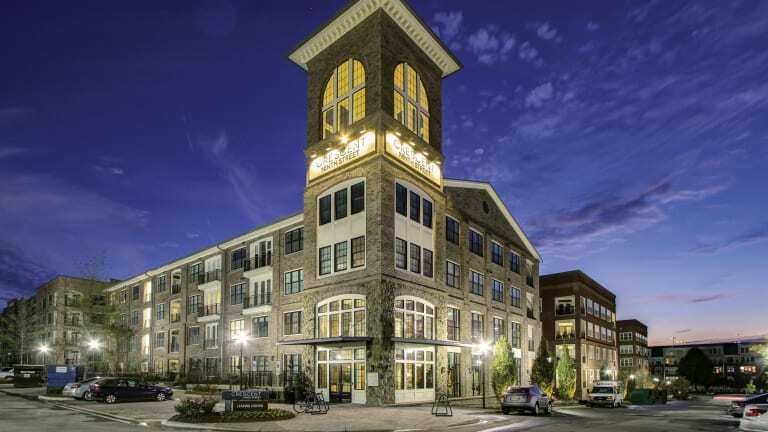 This gave Charlotte-based developer Crescent Resources and the architectural firm Historical Concepts, which has offices in Atlanta and New York, the opportunity to create a community of industrial-style luxury apartment buildings that look as though they had been erected from the 1800s through the 1930s. The tower, which marks the entrance to the complex, features a rusticated stone base, a bracketed cornice and arched masonry window surrounds. Its exterior also provides prime space for developer branding. Those neighbors, a series of historic commercial buildings, provided the context, Cogar says, “to play off their authentic style and period details.” The existence of a Main Street-style urban fabric allowed the firm to “design from the edges in as opposed to the inside out as is typical in garden-style apartments,” he says. This design philosophy is not often a priority for multi-family developers, however, Crescent Resources has proven to be an exception, he notes, providing the firm an opportunity to stretch its legs and design a residential project of a much larger scale. 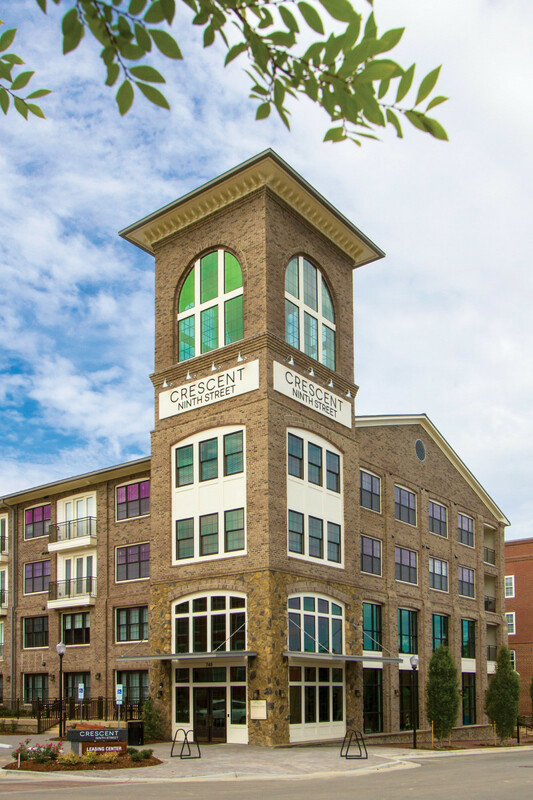 “This is our third apartment development in the state with Crescent,” says Cogar, adding that Brian J. Natwick, president of Crescent’s multi-family businesses, possessed a singular vision for the project. “They are committed to building luxury apartments in trending communities, and their concept is to build beautiful buildings such as those done before World War II instead of simply constructing a stack of blocks.” To date, the Ninth Street development is Historical Concepts’ biggest collaboration with Crescent Resources. A connector bridge has factory features—supporting wood trusses, steel fittings and plank decking. The scale and rhythm of the windows also reference historic factories. The boldness starts at Ninth Street’s main entrance, which announces itself via a robust tower that wears its 19th-century style with pride. “There is historical precedence for such towers in historic mill buildings,” Cogar says. “They served a functional purpose; here we just reinterpreted that function.” In the case of Ninth Street, the tower anchors the complex and houses the leasing office. Its rusticated stone base gives it gravitas, and its bracketed cornice and arched masonry window surrounds root it in the 1800s. The Ninth Street campus features five residential buildings that fit into a historically accurate timeline that progresses from “the ornate brick details of mill architecture and the utilitarian warehouse form with small punched windows to the larger scale of the mid-century factory highlighted by oversize window openings,” Cogar says. Each building has its own sense of style, giving the project the feel of a community with five distinct neighborhoods. 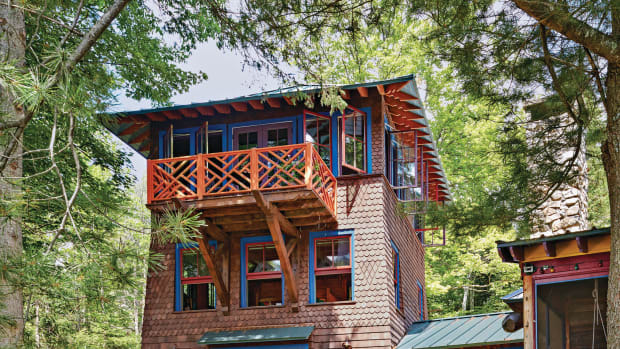 The structures are connected via stunning enclosed bridges that feature factory-style walls of windows and industrial supporting wood trusses, steel fittings, and plank decking. By adhering to architectural history, the Historical Concepts team—which included Strickland, Cogar, principal Domenick Treschitta, and project manager Clay Rokicki—was able to scale the buildings to their surroundings. The uneven topography, Treschitta explains, also was an incentive to vary the massing of the 303-unit complex. A bridge similar to those seen in factories serves as a light-filled connection between two buildings in the Ninth Street complex. 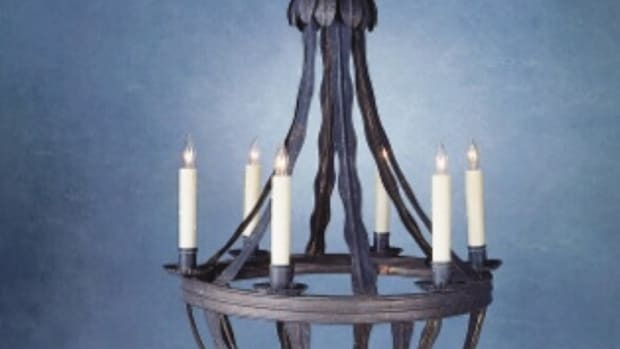 The material—wood—suggests it was a latter-day adaptation. 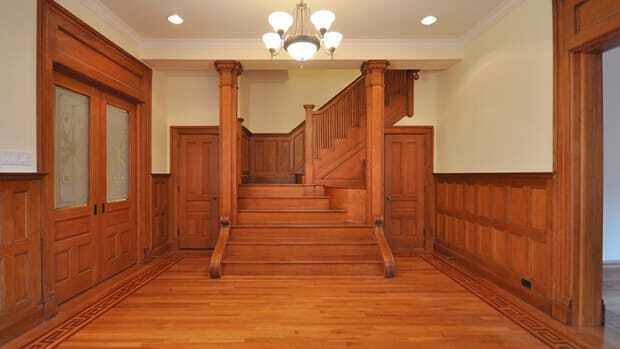 In addition to architectural styles, one prime way the team conveyed the passage of time was through brick choice. Sourced from Custom Brick and Supply Co. in Raleigh, North Carolina, the new bricks follow the team’s historic, fictional timeline, changing color from the reds and oranges favored in the Victorian era to the darker brown hues of the 1920s and 1930s. Every building has its own landscaped courtyard that is distinct in size and shape. The landscape design, by Cline Design Associates, a Raleigh- and Charlotte-based company that also served as the project’s architect of record, includes a sunken garden with a dog run. 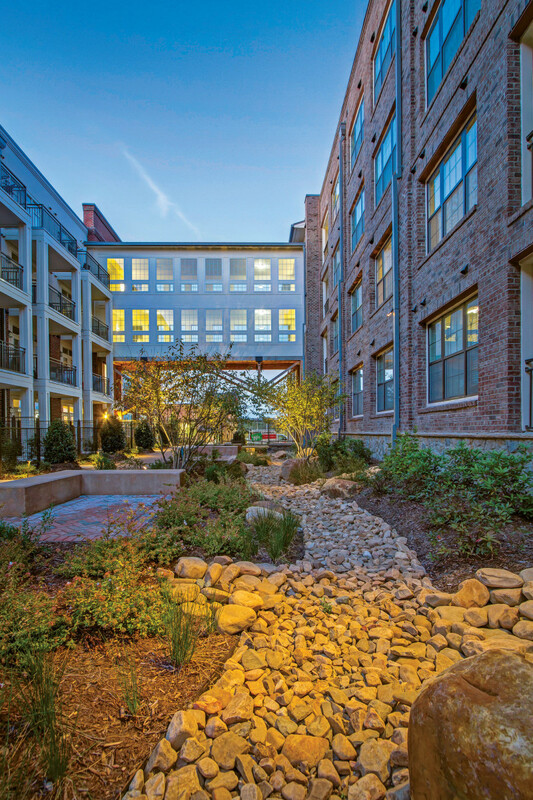 The buildings’ courtyards feature low-maintenance native plants that provide shade, color and privacy for units while framing public views and passageways. 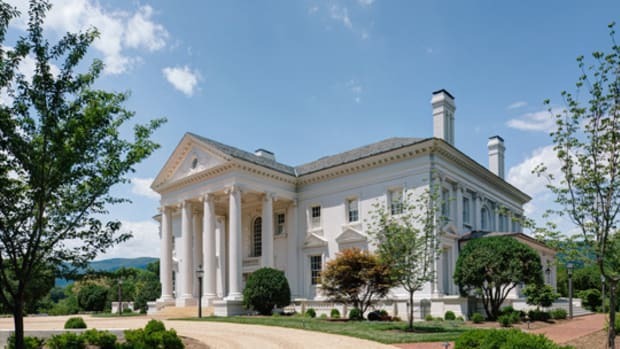 In addition to a variety of evergreens, notably arborvitae, holly and boxwood, the plantings include azaleas, crepe myrtle, and native ornamental grasses. Ninth Street, which was completed in 2015, has settled into the neighborhood nicely. Brick Supplier Custom Brick and Supply Co.
A landmark row house in Upper Manhattan is reborn, thanks to efforts by Zivkovic Connolly Architects.